We're committed to providing all our passengers with excellent customer service and a seamless journey. Please see the information below highlighting who this service is available for, detail on the service provided and our quality standards we expect to achieve. In order to book assistance please advise your airline or travel agent in advance – ideally, more than 14 days prior to departure or at the time of booking your flight. 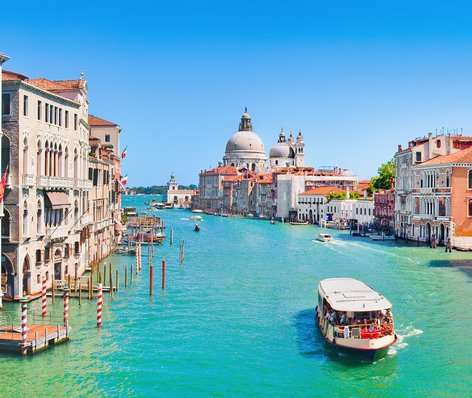 The minimum notice we would advise you give your airline is 48 hours prior to departure. However, if you have been unable to book assistance we will make all reasonable efforts to assist you on the day. Please note that our Reserved Seating Area/Mobility Assistance reception area has moved. It can now be found just outside the Domestic Arrivals doors (sign posted "Special Assistance") opposite the Airlink 100 bus stance. At Edinburgh Airport, we are responsible for providing assistance within the airport. Your airline is responsible when you are on board the aircraft. A ‘disabled person’ or ‘person with reduced mobility’ means any person whose mobility when using transport is reduced due to any physical disability (sensory or locomotor, permanent or temporary), intellectual disability or impairment, or any other cause of disability, or age, and whose situation needs appropriate attention and adaptation to his or her particular needs of the service made available to all passengers. Those able to walk up and down stairs and move about in an aircraft cabin without assistance, but who require a wheelchair or other mobility aid for moving between the aircraft and the terminal, inside the terminal and between arrival and departure points in the landside terminal. Passengers unable to walk up or down stairs, but can move about in an aircraft cabin and require a wheelchair to move between the aircraft and the terminal, in the terminal and between arrival and departure points in the landside terminal. Passengers with a disability of the lower limbs who have sufficient ability to take care of him/herself and can move about in an aircraft cabin with the help of an onboard wheelchair but requires assistance when boarding and disembarking an aircraft. Passengers who are completely immobile and have complete reliance on a wheelchair or any other mobility aid and who require assistance at all times from arrival at the airport to seating in the aircraft, or if necessary, in a special seat fitted to his/her specific needs. The same applies in reverse. Passengers who are blind or have a visual impairment. Passengers who are deaf, have a severe hearing impairment or who are deaf without speech. Blind and deaf passengers who can only move about with the help of an accompanying person. Passengers with any other form of disability that may require special assistance. Passengers with temporary injuries, such as a broken leg. 80% of customers should wait no longer than 10 minutes for assistance. 90% should wait no longer than 20 minutes. 100% should wait no longer than 30 minutes. 80% of customers should wait no longer than 25 minutes. 90% should wait no longer than 35 minutes. 100% of departing passengers should reach their aircraft in time to enable timely pre-boarding and departure (dependent on traveller reporting time). 100% of connecting passengers should reach their aircraft in time to enable timely pre-boarding and departure (subject to flights arriving and departing according to schedule). Advise your travel agent at the time of booking or contact your airline at least 48 hours before your flight to advise them you will require assistance when travelling. Passengers are encouraged to always pre-book assistance with as much notice as possible. However if you have been unable to book assistance we will make all reasonable efforts to assist you. Please advise your airline at least 48 hours before you travel if you are travelling with an assistance dog or with your own mobility aid such as a wheelchair or scooter. * Each airline at Edinburgh Airport may have differing rules and regulations on booking special assistance. Passengers are advised to contact their own airline for further information before they travel. At Edinburgh Airport, we are always looking to improve the passenger experience. In order to do this we work closely with local charities and organisations through our Edinburgh Airport Special Assistance Consultative Committee. Please following the signage to the appropriate zones in our car parks for wide disabled parking bays. For those drivers who are Blue Badge holders we will give 30 minutes of free access to any of our car parks. Just make your way to the nearest customer service kiosk to have your ticket validated when you arrive. Prices are displayed clearly at car park entrances and are listed on the parking section of our website. There are designated Blue Badge spaces in all of our car parks. These are clearly signposted on arrival. Telephone help points are located near blue badge spaces and help will be provided free of charge for passengers who need special assistance. Assistance is available for passengers with a disability, who require help with provision or movement of a wheelchair or help with baggage. Please contact a representative from Omniserv using one of the telephone help points. Those with a Blue Badge should leave this clearly displayed on the car dashboard. However, if you wish to park in the designated spaces but take your blue badge on your journey, you will need to show your badge to the car park operator who can be contacted via the help button at the pay stations or by visiting the customer services office. You must pay for car parking tickets at the customer services office or pay stations before returning to your car. If you require any assistance when paying please press the help button. There are designated Blue Badge spaces close to the bus stop and the customer service office. Please follow the signage to these spaces. A help point is located at the car park pay station. All car park transfer buses are fully wheelchair-accessible. If you have not already pre-paid, you must pay for car parking at the customer services office or automatic payment machines before returning to your car. If you require any assistance when paying please press the help button. For further information on getting from the car park to the terminal building, please contact the airport car park information line on 0844 770 3040 * (UK) or +44 (0)131 348 4203 (from outside the UK). Drop-off and pick-up zones are located on the ground floor of the multi-storey car park. Blue Badge holders are given 30 minutes of free access to the pick-up zone. Please follow signs to the pick-up zone for either drop-off or pick-up. Please have your Blue Badge clearly displayed on your dashboard. Please contact the car park operator at the customer services office in the foyer to validate your ticket. If you have your Blue Badge with you and are being collected at the airport, your driver should contact the customer service office to allow access to a designated bay. After producing a Blue Badge, the driver will be allowed 30 minutes of free parking. There are 10 disabled parking bays available here. 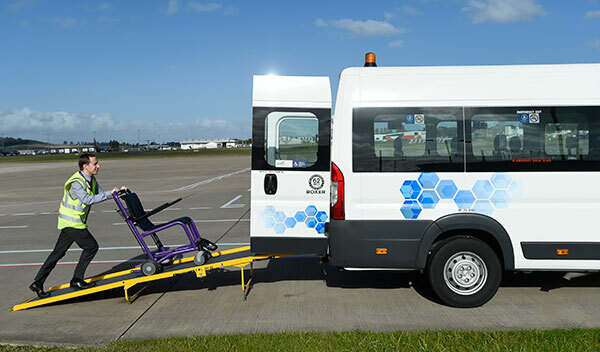 The customer service office is accessible for wheelchair users and two of the airport transfer buses are equipped with access ramps. If you require any further information please call 0845 056 7080. Disabled parking bays are located next to the reception and bus stop. Please follow the signage and report to reception (open 24 hours) if you require assistance. Controlled entry and exit barriers are in operation so there is no need to report to reception unless you need to. Telephone numbers to call for assistance can be found in the car park and on the bus shelter. The reception is accessible for wheelchair users and two of the airport transfer buses have lowered suspension and ramps. Assistance can be arranged if you require help with your luggage. If you require any further information please call 0131 333 3377. There are six disabled parking bays. Transfer buses have steps only but assistance with accessing buses is available on request. On your return journey, your car can be brought to the car park reception for collection. If you require any further information please call 0131 333 3445. Taxis – when booking your taxi transfer, please advise the operator of your specific requirements. For a black cab, call City Cabs on 0131 656 0830 or for private hire, call Edinburgh City Private Hire on 0131 555 5555. *Please note that distances have been rounded to the nearest 5m. We strongly recommend that you arrive a minimum of two hours prior to the scheduled departure time of your flight, irrespective of the destination, note that at Edinburgh Airport some of our carriers close their gates promptly at around 30 minutes prior to the scheduled departure time. This recommendation is to ensure you reach your gate in plenty of time to be pre-boarded, following the security process. If you arrive at any point other than the terminal building, aren’t already in possession of your boarding card, or if you have bags to check-in and require assistance with any or all of these tasks we would further recommend that you allow extra time for us to assist you through these processes. If you wish to discuss your arrival plans at Edinburgh Airport please contact us through our feedback form and we will be happy to advise you. Low-level benches are available on both sides of the security search area to allow passengers to prepare and to repack their belongings. If you are carrying liquid medication which is over 100ml, please notify the Security Officer at the loading station and present any supporting documentation. Please note that if you remain in your wheelchair when passing through the automatic metal detector, the metal in your wheelchair will activate the archway and a routine body search will be necessary. Private search rooms are available on request. For full details on the security search procedure and regulations, please visit our dedicated security pages. We are constantly working to improve the airport experience for our vulnerable passengers who may not want to share details of their hidden disabilities. If this applies to you or someone you're travelling with we can offer you a special lanyard or pin to wear on your journey through our airport. This will identify you to staff as someone who may need additional support or understanding whilst you are travelling through our airport. Our staff have been specially trained to recognise the lanyards and act accordingly. To pick up a lanyard at Edinburgh Airport, please go to one of our Assistance Reception areas. We will be happy to give you a lanyard or pin, even if you haven't requested or need special assistance and are happy to undertake your airport journey unescorted. This will help our teams recognise and assist you at every stage. Please note that using a lanyard or pin is entirely optional and you’re welcome to keep either for your next journey to or from Edinburgh Airport. For use on board the aircraft and designed for safety and passenger comfort. The Columbia Aisle Chairs allows the passenger to be easily moved down the aircraft aisle to their seat. 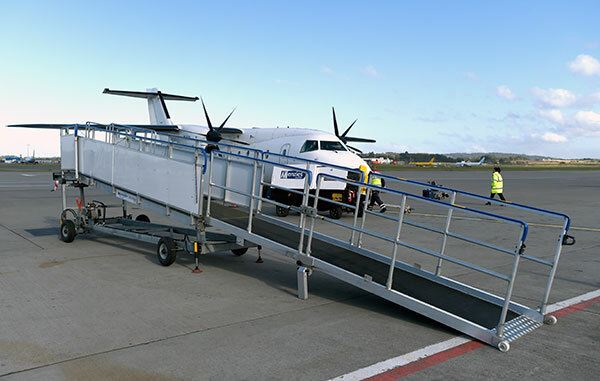 The Aviramp Lite is a towed aircraft boarding ramp designed for use by all passengers, including those who have restricted mobility or use a wheelchair. This piece of equipment eliminates the need for stair climbers and manual lifting. 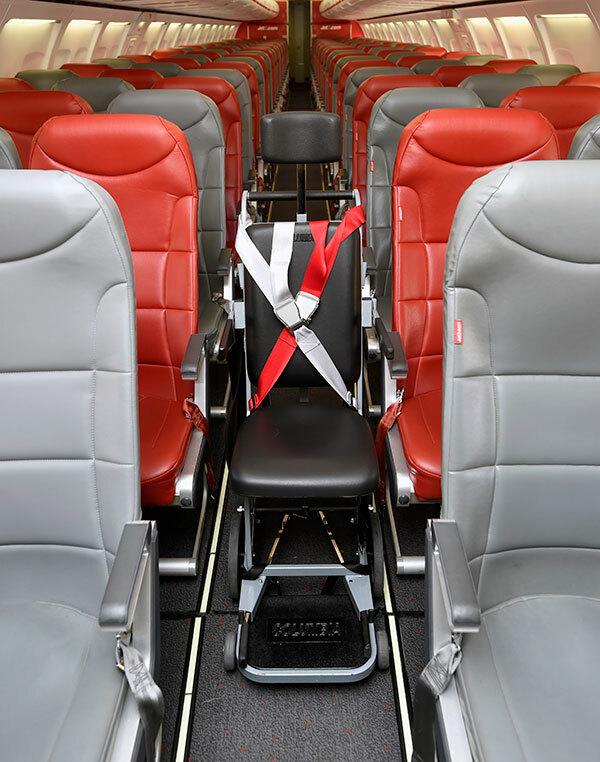 Omniserv operates a number of AmbuLift vehicles which offer a comfortable and easy transfer for passengers to and from the aircraft. 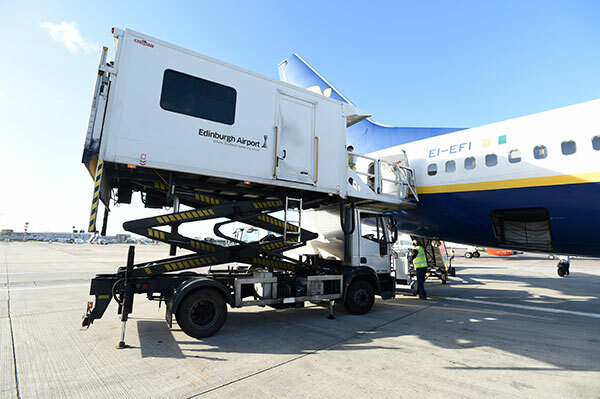 Edinburgh Airport and our Special Assistance providers Omniserv are pleased to offer Haycomp’s Eagle 2 Hoist. 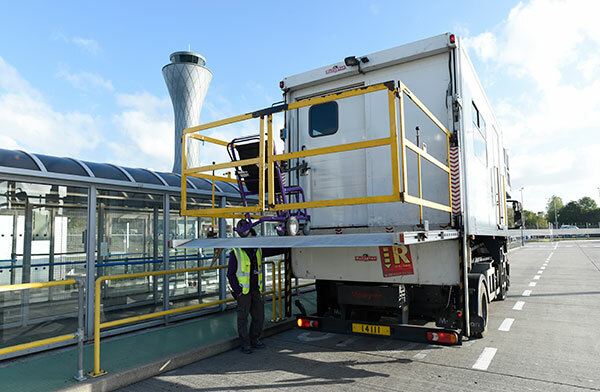 This hoist is designed to improve the service, safety and accessibility for passengers with reduced mobility and forms part of Edinburgh Airport’s commitment to improving the services offered to our passengers. Seat allocated with an armrest which lifts between the seat and aisle. Please ensure that you speak with your airline at the time of booking your assistance and advise that you will be requesting the use of the Eagle 2 Hoist at Edinburgh Airport and that your seat allocation requires to meet the relevant criteria for the aircraft type. Note that use of the equipment is provisional upon this correct seat allocation by your airline. The hoist should always be pre-booked (subject to availability) at least 48 hours before travel. All requests to utilise the hoist should be made in writing to eaglehoist@edinburghairport.com as soon as you are aware of your travel details. 1. Customer name and contact details. 2. Date of travel and flight details. 3. Passenger’s height and approximate weight. 4. Are you using your own sling? 5. Have you used the service before? Present yourself to check-in on arrival so that all pieces of the mobility aid are tagged with a luggage label and an Electric Mobility Aid (EMA) “Safe for Carriage” form can be completed. Make your way to the special assistance reception just outside the domestic arrivals doors, in order for the EMA to be checked for compatibility on the aircraft. Proceed through security and to the departure lounge, where you will be met at the gate by one of the Omniserv Operatives to help board onto the aircraft. The EMA will be taken to the baggage hold after you are on board the aircraft. 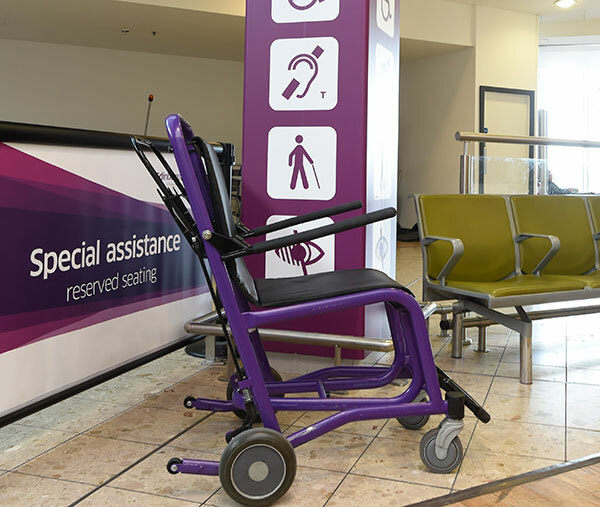 On arrival at your destination, the airline crew and handling agent will arrange for your mobility aid to be collected before you are disembarked from the aircraft. 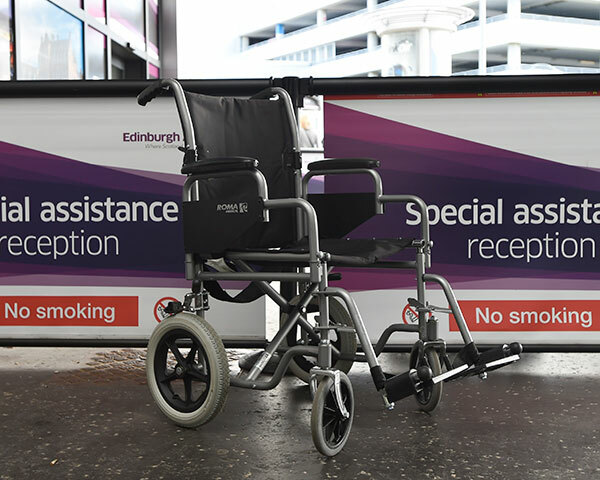 If your mobility equipment is damaged on arrival, it is the responsibility of Edinburgh Airport to organise a temporary replacement whilst it is being repaired. However claims for cost of the repair should be made to the airline. * For details on how to prepare your mobility equipment for carriage, please contact your airline. Only assistance dogs are permitted inside the airport terminal. It is a requirement that you notify your airline at the time of booking if you wish to travel with an assistance dog. When flying into Edinburgh Airport we also recommend that you contact our animal receiving centre at least 48 hours prior to your flight. Centre staff will guide you fully through the health requirements for your assistance dogs entry to the UK and process your dog on arrival. Please e-mail arc@extrordinair.co.uk or call 0044 131 317 7277. Failure to contact the animal receiving centre to notify them of your arrival may result in delays to your onward journey. A dog spending area for assistance dogs only is located next to the multi-storey car park. A dog waste bin is located within the spending area. SignLive, an Edinburgh-based British Sign Language Online Interpreting Service, has recently launched its Video Remote Interpreting service to provide British Sign Language (BSL) interpreters on demand at Edinburgh Airport. Edinburgh Airport is the first UK airport to introduce this service, which provides an instant way to communicate with Deaf and/or without speech customers by connecting with an online BSL interpreter via smart handheld devices. The service can be used throughout the terminal buildings, allowing airport agents to communicate with British Deaf people immediately and effectively. The system is available within our landside Special Assistance Reception on request, if you require assistance with your airport journey please ensure you notify your airline, our assistance team will be more than happy to help.